One of my favorite things to watch on Youtube is Plan With Me videos, so I thought it was about time to create one of my very own – in both written and video form. So for August, and for my debut process video, I decided to create a Plan With Me: Totoro Edition. In this post, you can read about my process in selecting this theme, how exactly I set up my bullet journal, and all of the things that came with figuring out how exactly I ended up filming and editing my video. I have loved the film “My Neighbor Totoro” ever since I watched it a few years ago. I feel a deep connection with the older sister, Satsuki, because she tries to take care of her little sister Mei the way I try to take care of my baby sister. When Satsuki can’t find Mei and runs tirelessly to look for her, I can always feel that same fear deep within me. Even though I know my little sister is safe, I can’t help but worry for her all the time! Satsuki’s concern for Mei, even when she’s mad at her, is something I deeply empathize with. In July, my little sister went on vacation and I was unable to video chat her at our regular scheduled time due to time differences. While it was only for a few weeks, I felt a little lost. My routine had been disrupted, and I missed my little sister so much without even realizing it. 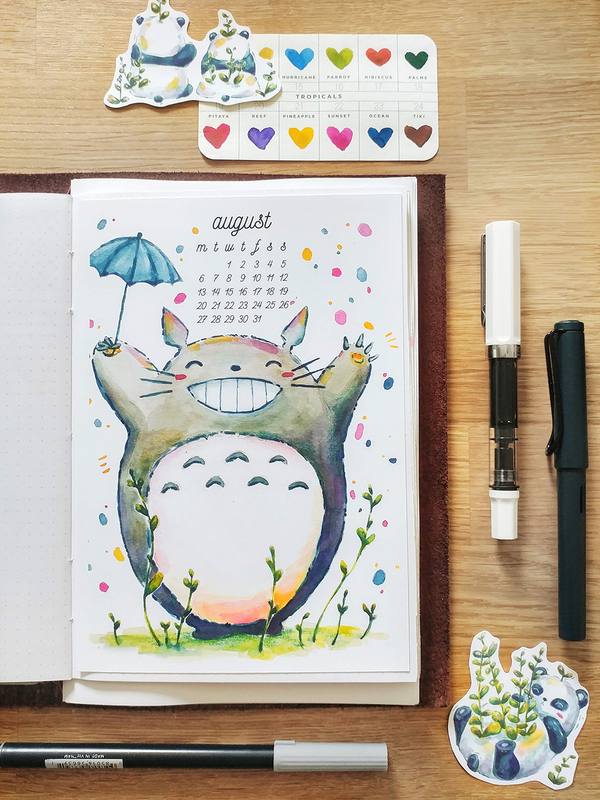 It felt pretty fitting to me, then, to decide on Totoro for my August theme! Plus, Totoro is really cute and cuddly, which is just the kind of thing I like to paint. In general, my monthly setup is really simple! I tried making elaborate spreads for a while but I quickly found that it was not sustainable for me. It was too much work, and I didn’t want to spend all of my time on my bullet journal. I discovered that I prefer creating art separately. Because of that, my setup is truly minimal. I only have 2 spreads before my weeklies: an overview page and a tracker page. My overview page includes a month in list view, similar to the original bullet journal setup. I like the list view because it almost feels like a to-do list of upcoming events! I also have a to-do list for the month and a projects section. The to-do list could include anything, but it usually has some shop-related stuff and some personal things like “build IKEA furniture” or “call a friend”. This month, among a few other items, I’ve listed “start Christmas planning”. The projects section is my way of attempting to limit myself to a few projects a month, since that was one of my resolutions this year. Most of the time, the projects are too big to actually complete within a month, but that’s okay. It gives me a framework for what I want to work on for the next 30ish days, and that’s what I need it to do. For August, my projects include painting a housewarming gift for a dear friend and creating birthday presents for my partner. At the very bottom of the left-hand page, I do some tracking, so I can visualize my growth in those avenues! I’ve found that this is actually really helpful. It helps me focus less on the minute details and instead be able to see exactly how much each thing has improved by the month. Finally, on the right-hand side, I keep a gratitude log! I just jot down something for every day, and I switch the inks I use each day so I end up with a duo-colored page of tiny handwriting. My habit tracker is pretty extensive, but it’s actually mostly for tracking my physical and mental health. I don’t pressure myself to fill out every little bubble (and I actually can’t! I designed it that way) and the page gives a great overview for my progress over the month. I’ve gotten a lot of questions on Instagram about how my chart works, and it’s pretty simple! The numbers at the top go from 10 to 10, like the hours on a clock, and I use it to track the hours I sleep. At the same time, the numbers that go 1-10 also function the x-axis for a composite graph! I track the actual number of hours I slept (1-10, I generally don’t sleep over 10 hours), my average mood for the day (out of 10), my water intake (the percent of water I drank compared to what I should be drinking, based on my water app), and my step count (each number accounts for 1000 steps). The result is a graph that looks kind of complicated but is actually really simple to keep track of. That’s it! After the tracker page, I go straight into weeklies, which I set up every week and therefore did not show in the video. I post my weeklies sometimes on my Instagram, so check them out there. For the Totoro painting, I used Prima Watercolors Tropical Confections palette on Canson Mixed Media paper. The paper does warp a little from the water, but it’s affordable and the warping is fairly minimal – at least, it’s tolerable for me personally. For the journal, I’m still using my DIY notebook! For the bulk of my writing, I use a TWSBI Eco, which is my true love in the form of a fountain pen, with Noodler’s Lexington Gray ink. I really enjoy my Noodler’s ink, but I’ve set my sights on some fancier gray inks for the future. Figuring out how to film this video was actually the most difficult part. I don’t have a video camera, so I used my phone on a selfie stick. Then, I precariously balanced it in a flower pot and weighed it down with a water bottle. My setup is as unsophisticated as it gets. Sometimes I would catch the selfie stick slipping, which led to quite some unusable footage. Plus, I definitely haven’t gotten used to painting while having a large pot in the way. Also, I had to film early in the morning because it’s the only time I get any decent light in my apartment. Since I actually do get up fairly early now, that wasn’t a huge problem. But because I wanted to document the entire painting process on video, I couldn’t work on the painting after I got home from my job. I did end up painting in the little confetti rain at night, though. I just couldn’t help myself. 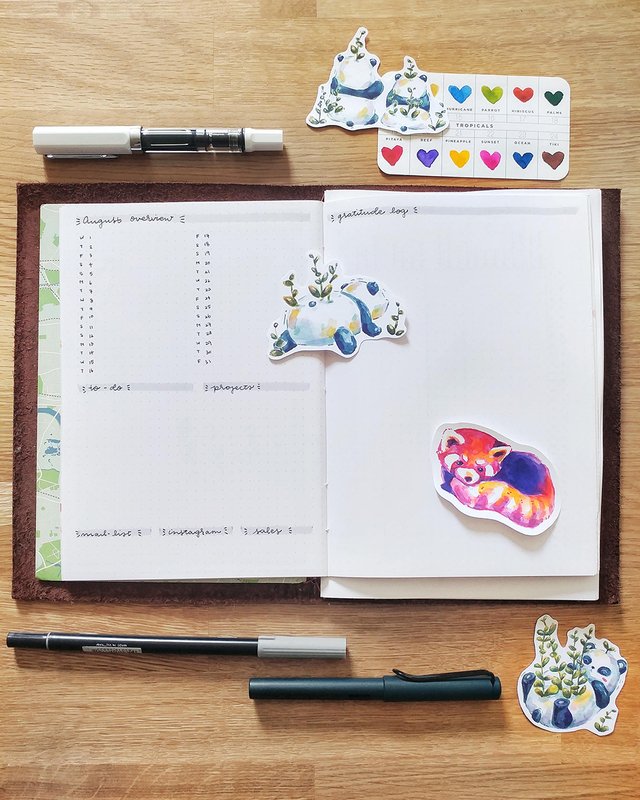 The Products: Printables & Stickers! 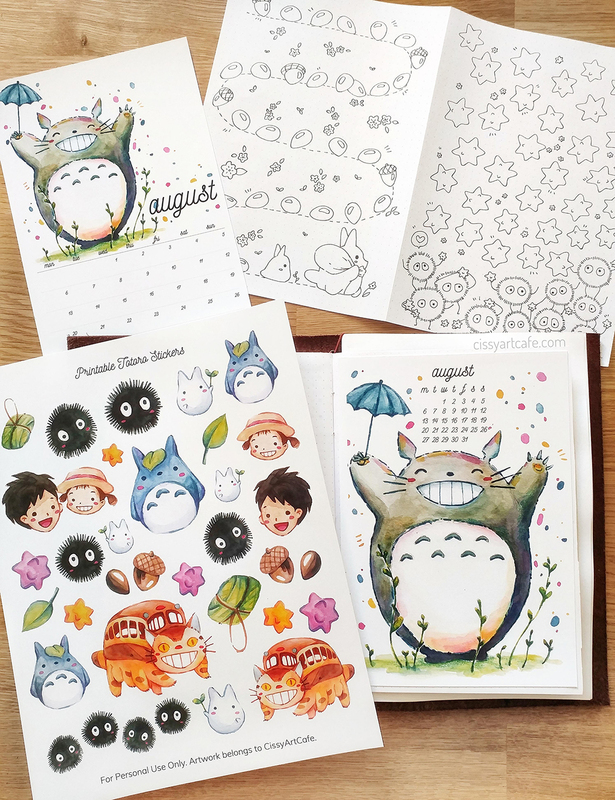 As usual, I have printable versions of my Totoro calendars up in my shop. These include a small calendar and a grid calendar, plus there is a Sunday and Monday-start week to pick from! If you’re not reading this in August and you still want this, all of my printable calendars are customizable. I will switch out the month for you at no extra cost to you. Of course, I couldn’t create this adorable setup without also making a bunch of accessories to go with it! 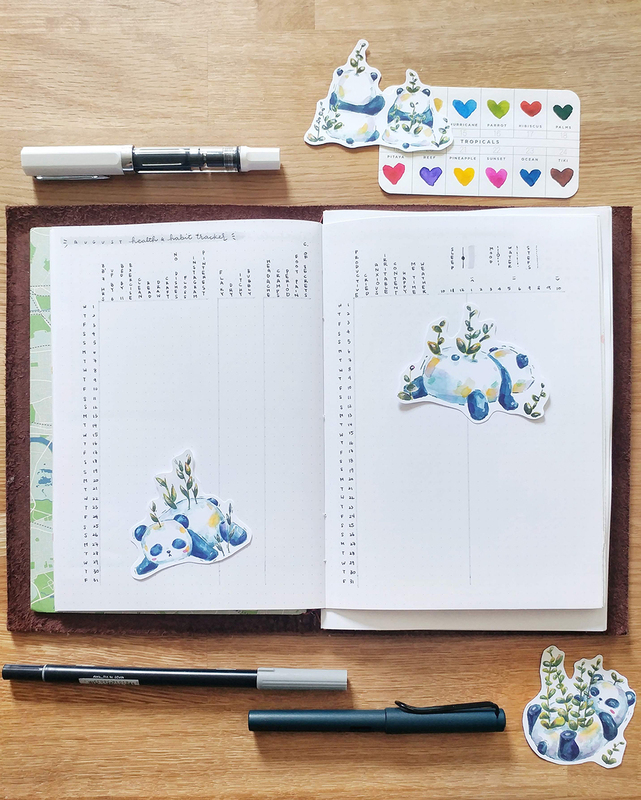 While I am still using my year-long geometric animals mood tracker, I used to love my monthly trackers – so I made two! The first tracker is of two little Totoros dropping acorns as they run by, and the other is of soot sprites cheering over some star-shaped candies. I also painted a bunch of Totoro-themed characters and items to turn into stickers! I have a printable version, where the stickers are a little smaller, and a physical version, where the stickers are bigger. The printable would be perfect for your planner! Personally, I’m sticking my Catbus sticker on my laptop. Creating this setup and filming the video was really fun, and I’m excited to get better at creating them! I want to play around with how I film, and get more comfortable with having a camera on while I paint. I’d love to film all sorts of fun process videos – and maybe even vlogs someday! At some point, I’d like to get comfortable with my voice enough to speak on camera, which is a silly insecurity but one that I have nonetheless. Do you make videos? If so, any tips? Do you keep a bullet journal? If you do, do you pick themes to base your month on? I like to think that mine is a great combination of both an artistic journal and a minimal one. What’s your style?